Edinburgh retail sales were down -4.8% in August 2015 compared to this month in 2014. This means that Edinburgh’s retailers performed worse than their Scottish peers as the Scottish average fell only -2.4% on a year earlier; in the rest of the UK however, sales were up a marginal 0.1%. It was the same story in July and of course the decline of footfall and sales in the Grassmarket in particular have been well documented for several years now. With Avalanche having a presence in the Tron Church and then St Mary’s Street in the last year I’ve seen first hand that the Grassmarket is not the only area to suffer. For businesses footfall is irrelevant and what has to matter is spend. Even then there is a widening gap as visitors continue to buy food and drink (not a huge surprise) but then cut back on non-food items. When I first became involved with what would be built on the council site in King’s Stables Road I was surprised at the general consensus that something as high end as possible was needed for the arts complex, flats and hotel. As a kid from a council house in Liverpool it didn’t sit well with me. However the reality of the situation soon became clear. We needed to compete with the many other cities both UK and worldwide actively chasing the high end market and the associated spend and for too long Edinburgh had just relied on its reputation as a cultural city. Without a doubt Edinburgh had a head start but it was clearly starting to be left behind by others maybe not hampered by the focus here on August. I still pushed for attractions that would appeal to all incomes but the argument for a top class hotel was strong. Sadly it looks like it is not to be though the planning as yet is not confirmed. While in the Tron I understood for the first time why Edinburgh has so many tartan tat shops. It is because visitors buy it. Exposure to The Royal Mile soon made that clear and you also have to question the council’s decision to allow so many traders selling silver made in Asia but “designed in Scotland”. Really !!! People do expect quality when they come to Edinburgh and quality there certainly is but often pushed into side streets or out of the city centre. Our move to St Mary’s Street enlightened me even more. 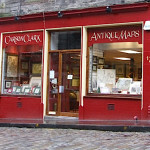 We have the Carson Clark Gallery next door selling antique maps and prints and forced to leave the Canongate by a vastly increased rent from the council when it is exactly the sort of shop people hope to see on The Royal Mile. Also though there is a Travelodge at the bottom of the street which traders tell me brings them very little business indeed. I too found this though I have to admit that recent concerts from King Crimson and The Damned did bring custom as fans stayed there. What was interesting during the Festival was how many visitors said they had had no problem getting cheap accommodation. Now I’m all for young families and couples being able to afford to visit Edinburgh on a budget. That has to be a good thing. 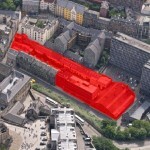 It would now seem though that Edinburgh has enough budget hotels for its needs. Which brings me to The Royal High School. Much has been made of saving the views it affords and I realised I had never seen these views. I do of course see Calton Hill every day and to be honest always considered it to look a bit cluttered and messy. I started to ask others and they too had not seen the view or were even sure what was meant. Now both sides in the debate over the establishment of a world class hotel take the views seriously but maybe they are not quite as important as some think to the people of Edinburgh. What has to be considered also is the undoubted economic benefits of such a hotel. The STV gifs of before and after wee very good but maybe to show balance they could have some fancy graphics showing the economic benefit to Edinburgh with and without the hotel. I do understand the significance of The Royal High School and those concerned I’m sure mean well but they have no more right to their views than anybody else. Once there is talk of Chinese ownership though they reach stickier ground. Nobody suggested boycotting Jenners when it was bought buy a Chinese conglomerate ! With King’s Stables Road there was a fantastic opportunity to create something special that would have promoted the arts and much improved the footfall through the Grassmarket. Sadly it very much looks like that opportunity is lost unless Edinburgh Council go back to the vision they themselves had for the site. 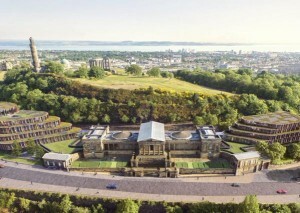 I don’t think anybody thinks the plans for the Royal High School are perfect but again to say that no notice of previous comments from concerned bodies has been taken is blatantly untrue just from what little I have seen and does the objectors no credit. It will I think send out a real positive statement to the world and it will be a real shame if planning is granted and then things are dragged out even longer by a public inquiry. Edinburgh’s economy needs a boost sooner rather than later and hopefully this will not be the only project to show Edinburgh is not resting on its laurels.